We regularly have people coming to us at Fine Framers with a collection of photographs of a special day, asking us to frame them in an appropriate way to help preserve the memories of that day for years to come. We advise that a collage arrangement, showing all the pictures together in a custom-made frame and mount, is among the best ways to do that – and it’s something that our founder, Tom McDermott-Walshe, even did for himself this week. Tom, his eight-year-old son James, and other family members were among the estimated 280,000 people who enjoyed a visit to the National Ploughing Championships – always a great day out, with so much on offer for all the family. This was actually James’s six visit to the annual event, so he’s literally been going to it for longer than he can remember! The camera got plenty of use that day… taking photos of James and Granny with the new hurl he bought (complete with Kilkenny colours on the grip), eating lots of ice cream, trying a soccer target practice game, having a go at milking a cow, some of the displays at the commercial stands…and even some of the ploughing itself! Tom assembled a selection of these pictures into a collage entitled ‘6 Years Ploughing!’ the following day. 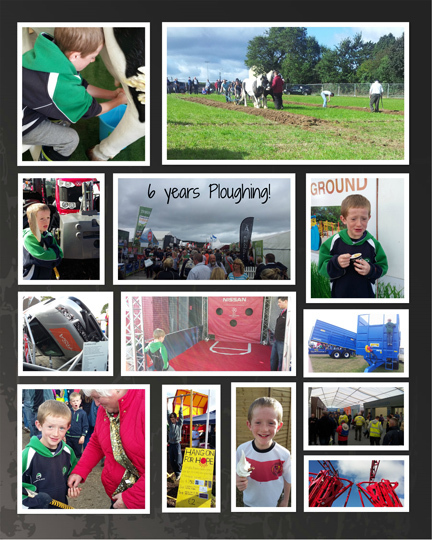 It will now help bring back memories of that great family day out for far into the future, and who knows how many more Ploughing Championship collages he may yet compile in the years ahead! He and other members of staff at Fine Framing can also do the same for you with your photos of any big day or occasion, be it a birthday party, a Christening or First Communion, a family holiday, or anything else. Just come see us at the Wexford Road Business Park on the outskirts of Carlow, and we’ll come up with various possible arrangements for your photos until we find the one you like best, and then take it from there. Incidentally, going along to the Championships is not the only connection we have with the Ploughing. 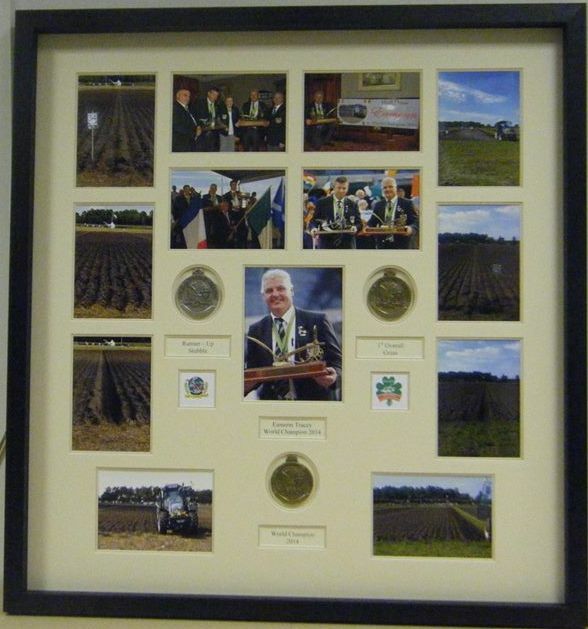 Among the other projects we’ve completed in the past is framing the World Medals won by champion ploughman Eamonn Tracey, alongside a selection of photographs of him and his ploughing at those championships. We’ve also framed collections of tractors and other agricultural memorabilia as part of our 3D Framing service – another speciality of ours which we always enjoy, as we delight in framing unusual items for our customers in ways that others cannot achieve. Let us do the same for you – just call to see us, phone us at 059 9135645, or use our Contact Us to get in touch.